Don't you just love how political “what ifs” always seem to crop up when the federal government changes hands as happened on January 2nd when the Democrats took control of the House. But one “what if” that never seems to go away no matter which party controls what, is “what if” JFK were alive today...would he be a Republican or would he remain a Democrat. Well, my answer to that question is that if former President John F. Kennedy (JFK) was alive today, I believe, he would have left the Democrat party and become a Republican. I even think Kennedy would be ashamed to have ever been associated with a party that has now become a bunch of far left liberals, progressives, misogynists, and miscreants who favor free-for-all socialism over democracy and hard work...a party who puts their selfish quest for votes and power over the good of the very country they took an oath to protect and whose laws they vowed to uphold. Kennedy would sadly find that the Democrat party of today is unrecognizable from the middle-of-the-road Democrat party of his day. Middle-of-the-road indeed as his Democrat party would not have looked away on the issue of illegal immigration; would not have negotiated with, bowed down to nor sold us out to dangerous religious ideologs like the mullahs in Iran and surely would not have allowed terrorism to fester and grow overseas let alone gain a foothold here on American soil; nor would Kennedy's Democrat party have allowed grown men to have access to ladies public bathrooms or attack Christians for refusing to bake a wedding cake for an openly gay couple. And in JFK's heyday there was no Democrat party talk of doing away with the Second Amendment for besides JFK himself being an NRA member, the Democrats of 50+ years ago did indeed honor the U.S. Constitution and the rights it afforded 'We the People' unlike the Democrats of today. And in Kennedy's day there truly existed a belief in American exceptionalism...which today's Democrats do not have nor want...and Kennedy took that belief and turned into both a vision and the reality of man walking upon the moon...a vision of exceptionalism he did not live to see reach fruition but a vision that without him might never have been. So while Kennedy, if he had lived, might have accepted some, but not all, of the social issues that are the part and parcel core principals of today's truly misguided Democrat party...after all he did refer to himself as a liberal in a 1960 speech and was the very man who actually launched Medicare and initiated food stamps...however with him being a devout and practicing Roman Catholic, Kennedy would never have agreed with today's Democrats on the issue of abortion. Nor would JFK agree with today's Democrats on foreign policy matters in general or on economics in specific for the man who championed a policy of lowering taxes said in 1962 that, “the Federal Government’s most useful role is not to rush into a program of excessive increases in public expenditures, but to expand the incentives and opportunities for private expenditures...” ...a Republican core principal...was the same man who boldly stood up to Nikita Khrushchev's Soviet Union, thus preventing the Cuban Missile Crisis from turning into World War III. And JFK would never back down, cater to, or condone those out today to kill us all for this was a man who unlike Democrats today did not fear naming America's enemy...he did it with the Soviet Union and today he'd do it again with islam. 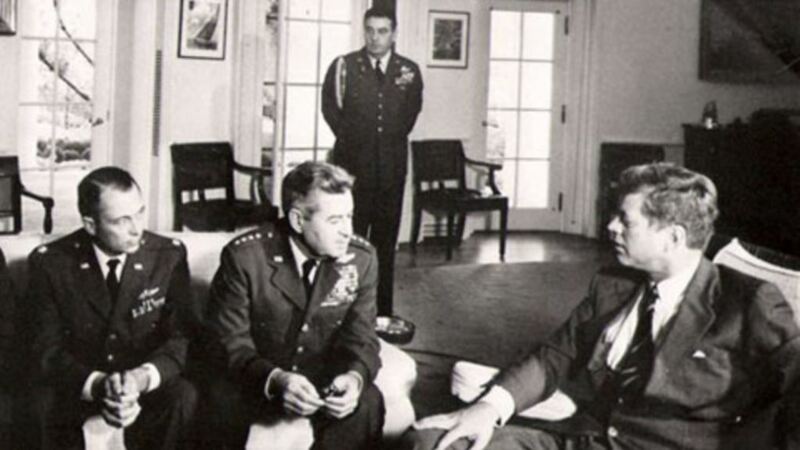 And Kennedy would have dealt with islam's violent sorts like he did with Khrushchev, in the open and with more than just a mere threat of using conventional force...but with using nuclear force if need be...for the man who was a WWII hero would not have accepted let alone abide by the politically correct nonsense of acquiescing to enemy that most of those in today's Democrat party consider to be their new foreign policy norm. Remember, JFK was not a party-driven president but a president who in the short time he served, did his best for the entire nation not just for those of his party. And while today's Democrats still like to think of themselves as the party of JFK, that thought belongs to their minds alone for JFK was never an obstructionist like today's Democrats are...he was a true champion of bipartisanship...a very dirty and politically incorrect word in today's Democrat-speak. And it was the Democrat party of JFK that died in that fateful motorcade through Dallas, Texas on Friday November 22, 1963 at 12:30 pm CT only to be reborn with LBJ...Lyndon Baines Johnson...the so-called champion of social justice and equality whose "Great Society" created more problems for this country than he or it ever solved. And from that very birth once honorable Democrats, for whatever reason, allowed their party to be hijacked and turned into a party of abject progressivism, misguided inclusion, and overt socialism that would most surely have JFK turning over in his grave. And so the free-for-all, God-hating, muslim and illegal condoning Democrat party of Obama, Clinton, Pelosi, and Schumer does its best not only to dishonor JFK...one of their own supposed political icons...but to obstruct and derail any and all legislation today's Republican party proposes no matter if it be in the best interest of our nation...so very anti-Kennedy like if you ask me. So with that said, lets lay out the the core differences between what both parties want in order to understand how and why John F. Kennedy would have left the Democrat party. First, the Democrats. It's way more than just a bit obvious that today's Democrat party wants government in total control of our lives from cradle to grave with 'Big Brother' (as in big government) watching over us all to be the new societal norm. Democrats want socialism over capitalism with free markets be damned while of course wanting the rich be punished with higher taxes to pay for the gimme-gimme sorts freebies and handouts in exchange for their votes. Democrats will continue to ignore not only the killing of the unborn but also the selling of their body parts to the highest bidder. And Democrats of course want minority inclusion to always trump Americanism. Obviously they want Medicare for all at our taxpayer expense while wanting minimum wage increases to turn entry level jobs into a career. And at the same time they strive to forever keep us dependent on Arab oil, the Democrat hierarchy will desperately continue on in their quest to see that the Second Amendment and all our firearms go bye-bye. So as the Democrats embrace globalism over American exceptionalism, they are working hard to have our military become but a mere side note while opening wide our borders to all. And ever so unsettling and for reasons not truly understood the party that “booed God” wants God to be permanently banned from all public venues. Now Republicans (of which I am one) want lower taxes for all with wages to be set by the free market. And we Republicans want personal responsibility for ones actions to override the lefts attempt at collective guilt, while so wanting the government out of our personal lives. We Republicans want increased military spending with our troops fighting to win (war is not a participation trophy event) while at the same time we want Roe v. Wade to be somewhat amended. Republicans demand capitalism over socialism (which fails every time when government runs out of other people's money), and we see health insurance as something best left to an individual's private discretion. Assimilation and Americanism over blanket inclusion is a Republican must as is no more welfare, handouts, or amnesty given to those who enter our country illegally. The wall must be built post-haste with the closing of our southern border until then if need be, and “America First” is the way it always should be. The U.S. must strive to become totally energy independent, and we Republicans so want the Trump witch hunt to end. And we can't wait for the day when Obama and Hillary are brought up on charges (there are so many to chose from starting with Benghazi); and Republicans want God the Father of us all to be welcomed any and everywhere and surely not mocked. We Republicans don't really ask for much now do we as all are truly common sense wants...but to Democrats it most certainly seems like too much even though what Republicans currently want is more inline with what JFK wanted some 50+ years ago than it is with what Obama, Hillary, the left side of the aisle, or any Democrat considering running in 2020 wants today. 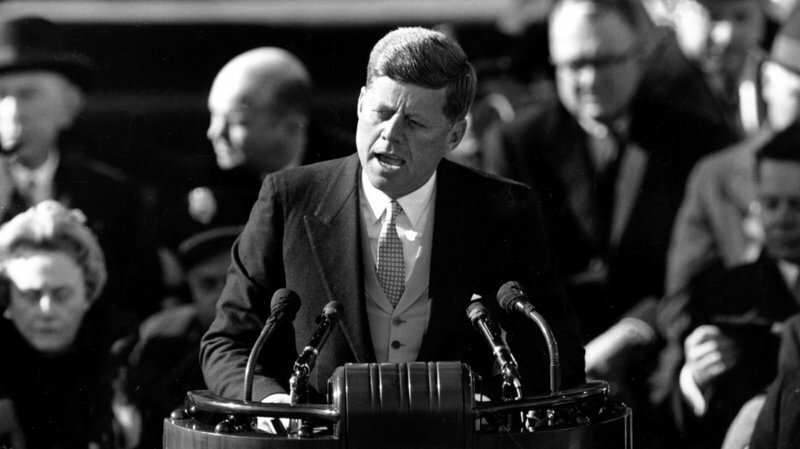 And remember, anyone who pushed as hard for a large across-the-board tax cut as Kennedy did; anyone who diligently worked to free up markets at home while at the same time pushing for tariff reduction and an increase in foreign trade (JFK held the belief that it would be American consumers who would be benefiting from competitive prices); and anyone who was as cautious about the size of the budget as Kennedy was...truly understood then what President Trump understands now...that only permanent tax cuts provide a true economic stimulus while not increasing the national debt in the long run...the very concept lost on the Democrats of today. John F. Kennedy truly grasped the concept of fiscal conservatism and would never align himself with today's tax and spend Democrats. In fact, again in a 1960 speech Kennedy stated that, “I see no magic to tax dollars which are sent to Washington and then returned,” which is the epitome of what's referred to as the voodoo economics of Keynesianism...the economic policy where spending output is strongly influenced by aggregate demand. If that's not Republican-speak than I don't know what is. For more political commentary please visit my RIGHT SIDE PATRIOTS partner Craig Andresen's blog The National Patriot to read his latest article Crap We Learned in 2018. 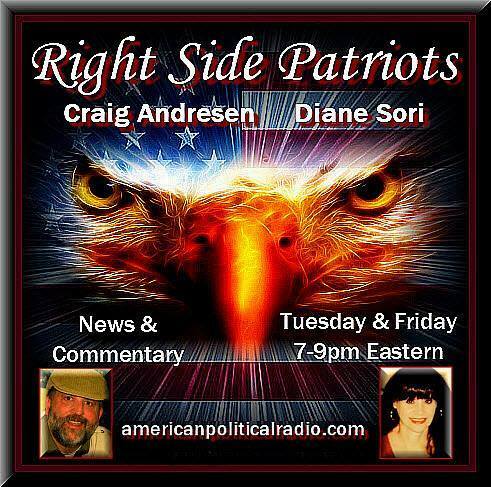 Today, Tuesday, January 8th from 7 to 9pm EST on American Political Radio, RIGHT SIDE PATRIOTS Craig Andresen and Diane Sori discuss 'John F. Kennedy...A Democrat No More'; 'Crap We Learned in 2018'; and important news of the day.